Exclusive AUTOSEAL technology now in a handled travel mug! 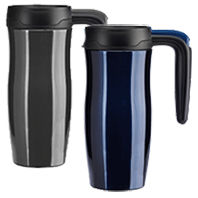 The AUTOSEAL Randolph Stainless Steel 16oz Travel Mug uses the same leak-proof and spill-resistant AUTOSEAL technology as our other AUTOSEAL travel mugs, but features an AUTOSEAL button integrated directly into the handle of the mug. Just press the button on the handle to sip and release the button to seal. The AUTOSEAL technology is combined with a double-wall, vacuum-insulated, stainless steel mug, providing exceptional temperature retention. Beverages stay hot for 4 hours or cold for 12 hours. Gun Metal $22.95 Coming Soon! Midnight Blue $22.95 Coming Soon!